Help hummingbirds remain well-fed throughout the summer with this Songbird Essentials Clear Hummingbird Instant Nectar Powder. This powder creates a clear nectar in moments, with no artificial dyes or sweeteners for a natural energy source. An included measuring cup makes it simple to mix this powder with water, and requires no boiling, for a great way to get children interested in bird feeding. The resealable, 24 ounce container makes 3.75 quarts of nectar, helping keep a few feeders full all season. Refrigerate the excess nectar to ensure it remains fresh for your hummingbirds. 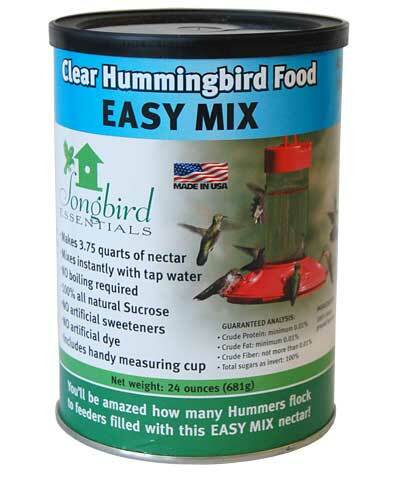 Keep a few feeders full throughout the season with this Clear Hummingbird Instant Nectar Powder. Made in the USA. Many birders opt to use instant nectar as it is convenient to make. Nectar may also be made at home by boiling water and mixing in white granulated sugar. Be sure to check our directions for making your own Hummingbird Nectar at home if this interests you.